Another cold and blowing day here in January oops we mean April. It certainly has not felt like spring with the cold temps and high winds. It looks like better weather is coming in the next few days we could certainly use a break. Customers are certainly looking forward to warmer days as our phone has been ringing with new charter bookings. We hope you give us a call soon so you don't miss out 1-800-676-4939. The fishing report for today unfortunately is wind and tide. No boats fished either in the sound or offshore. It was certainly a quiet day at the marina. Thank goodness the deli was open so we had some traffic to keep us company. Wind looks as though it will die down as the week goes on. We will keep you posted! We had one boat venture out into the Pamlico Sound this morning. They reported slow fishing conditions, however, they did catch a Flounder and they enjoyed their time on the water. Inshore trips are half day trips and are a wonderful way to enjoy fishing, clamming, or just exploring! 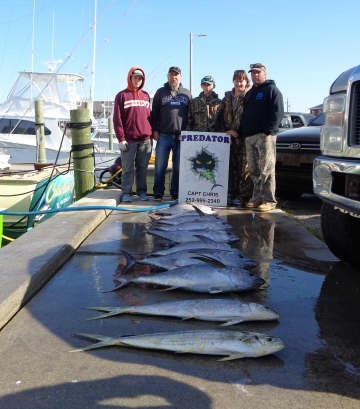 More than a handful of boats went offshore and returned with better catches than yesterday. Wahoo, Blackfin Tuna, Yellowfin Tuna and at least one King Mackerel were all thrown on the dock this afternoon. The wind continues to pick up and will bring rain as well as another blow over the weekend. At least the snow will remain to the north. Jeffrey Treser of West Carrollton, OH: 28 lb., 22 lb. and 20 lb. Blackfin Tuna on Predator. William Devilbiss of Baltimore, MD: 28 lb. Blackfin Tuna on Hatteras Fever II. Eric Magliacane of Brielle, NJ: 30 lb. Blackfin Tuna on Good Times. Joseph Williams of Three Bridges, NJ: 24 lb. Blackfin Tuna on Good Times. Thomas Hayes of Brick, NJ: 20 lb. Blackfin Tuna on Good Times. Brandon Smith of Brielle, NJ: 20 lb. Blackfin Tuna on Good Times. Gary Finnigan of Wall, NJ: 21 lb. Blackfin Tuna on Good Times. Several charters headed out to the Gulf Stream for a fair day of fishing. Temperatures plummeted during the night due to a northerly blow and the air did not warm up much during the day although the sunshine was abundant. Blackfin Tuna provided a good bite and a few Yellowfin Tuna were caught as well. Some Dolphin made it to the fish box! One boat had a Blue Marlin on but couldn't hold on to it. Sounds like an exciting day on the water. It's supposed to warm up tomorrow, with another blow on tap over the weekend. Harold Porter of Danville, WV: 22 lb. Blackfin Tuna on Release. Jonathan Porter of Delburton, WV: 27 lb. Blackfin Tuna on Release. Several boats out today on this beautiful spring day. Winds were fair and temps were in the 70's. 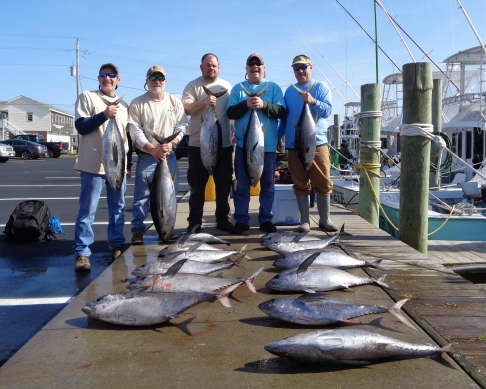 Docks were lined up with Yellowfin and Blackfin Tuna. Inshore boats finally struck gold with a great catch of Red Drum. 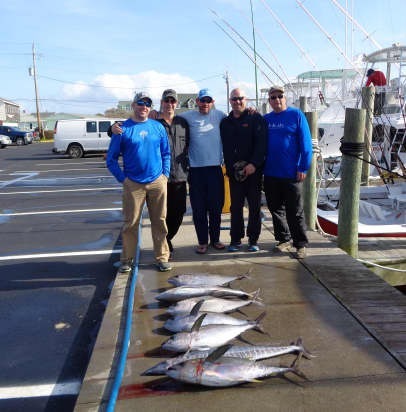 There were also catches of Albacore, Sea Bass, Wahoo and Dolphin. Good Times: Brian Clarke of Howell, NJ caught a 30lb Blackfin Tuna. Liam Clarke of Howell, NJ caught a 33lb Blackfin Tuna. Calypso: Robert Lapuh of Austin, OH caught a 21lb Blackfin Tuna. A few boats out fishing today. Weather was bright and sunny, but cooled off in the late afternoon. Temps were in the upper 60's. Yellowfin and Blackfin hit the dock with Good Times releasing a Blue Marlin. Good Times: Nelson Silva of Flanders, NJ released a Blue Marlin and caught a 25lb Blackfin Tuna. James Silva of Flanders, NJ caught a 27lb Blackfin Tuna. HAPPY EASTER! Several boats out today with good catches and lots of sunshine! We were certainly glad to see a little more spring hopping our way today. There were good catches of Yellowfin Tuna, some Blackfin Tuna, good King Mackerel. Mixed in were Snapper, Triggerfish and Wahoo. Release: James Akers of Landisville, NJ caught a 5lb Triggerfish. 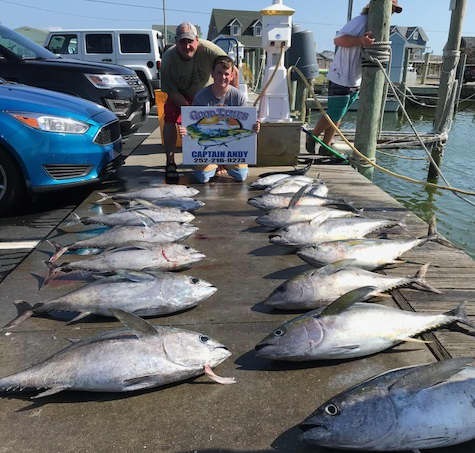 Good Times: Caleb Coble of Hagerstown, MD caught a 29lb Blackfin Tuna. Dirk Coble of Chambersburg, PA caught a 34lb Blackfin Tuna. Leif Coble of Baltimore, MD caught a 30lb Blackfin Tuna. 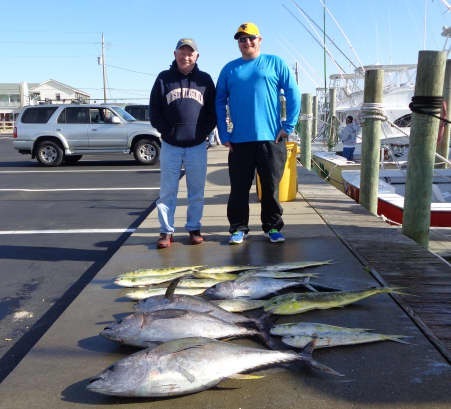 Erik Peirson of Frisco, NC caught a 33lb Blackfin Tuna. Hatteras Fever: Tori Davis of Aylett, VA caught a 50lb Wahoo. The March winds refuse to let up! Morning brought warmer temps with overcast skies. Several groups of anglers headed out to the Pamlico Sound hoping for some bites. SW winds cut short their time on the water, as it became much cooler and the fish were not biting. One group stayed out a little longer and caught a few Dog Sharks. Once again the seas were too big for the offshore fleet to get out. NE winds will probably keep anglers on shore again tomorrow. One more day to go - let's hope April brings more seasonable weather. We have almost made it through the mad, mad weather of this long month of March. Let's hope that she "goes out like a lamb" because the weather has been "like a lion" all month long! 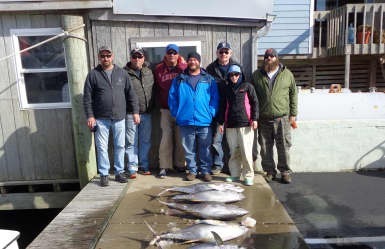 We sent several groups out fishing inshore today. They returned with red cheeks, however no Red Drum - they had one small bite. No one fished offshore as the seas were still too big. It is supposed to blow hard from the southwest tomorrow - we'll have to wait and see if it is fishable. 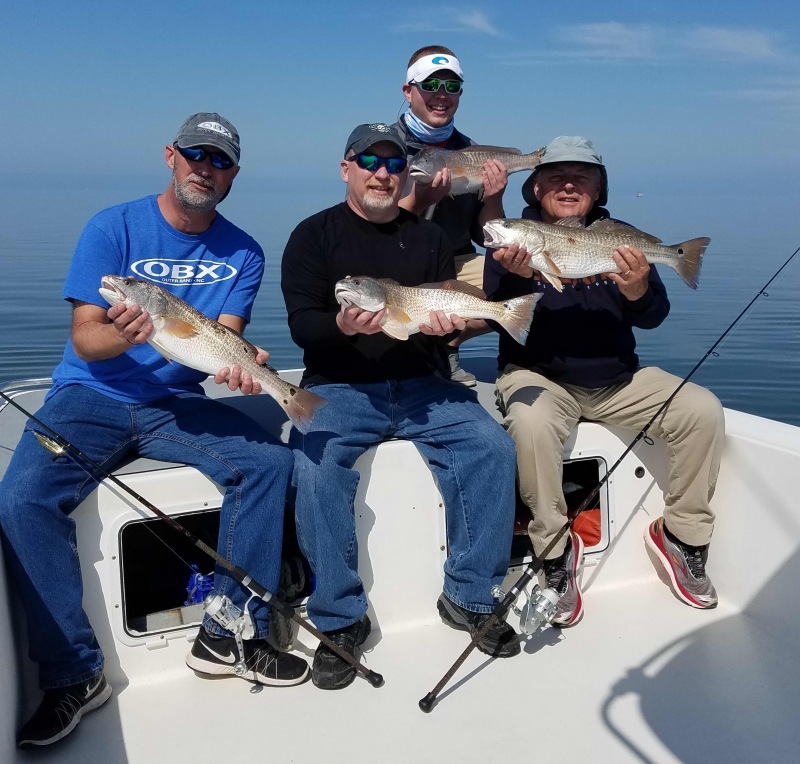 April is a great month to get out on the water, so give us a call at 800-676-4939 to book inshore, offshore, or near shore fishing adventures! Wind was keeping us inside today. It gave us time to get some new designs out on the floor. Check out our 2018 Captains T and our custom "Shore" T.